We don't eat a lot of chips at home, and when we do, they're more likely to be tortilla chips than potato chips. I don't know why that is, but potato chips simply don't fall into the shopping cart that often, and when they do, we don't gobble them down. A bag of potato chips can last a long time. When I got an email from the PR company that handles Crisproot cassava chips, my first inclination was to say "no thanks" but the email was clever and funny and the next thing you know I had cassava chips waiting for me on the front porch. I don't dislike potato chips, If there's a bowl of them at a party, I will munch. If there are some next to a sandwich, I will happily eat them.I grew up eating potato chips. They're the picnic standard. There are other vegetable chips I've tried that I didn't like. At all. No, thanks. Cassava chips, on the other hand, aren't weird like some of those other chips. They're actually very similar to potato chips. So what's the point? Why buy cassava chips instead of potato chips? For one thing, they have twice as much fiber as potato chips. That's always a good thing. And there's nothing weird or unnatural about them - they're just made from a different plant. They're just a tiny bit crunchier - more sturdy and less delicate - than your standard potato chip. Whether that's good or not depends on your mood, I guess. But they'd hold up really well to any dip that you have. And then we have flavors. You want something with a kick that isn't your usual chip? Go for the Thai ginger. So far I've only snacked on these, but I'm thinking these chips, crushed to smithereens, would make an amazing crust on chicken or fish. Or on top of mac and cheese. Or *crunch* what was it we were talking about again? Yeah, they're chips. Munch on them, crunch on them, add them to the shopping basket. Crisproot. Funny pr emails, and tasty chips. More fiber. Probably better for you. Now I need some dip. So tell me, what alternative chips have you tried that you like? And do you eat them because they're better for you, or do you eat them because you like them better than potato chips? Yep, along with snowboarding, skiing, and sledding, winter can bring sniffles. There's no cure for the common cold, but it sure seems like chicken soup helps. And even if you're not under the weather, what's better on a chilly day than a big bowl of chicken soup? It doesn't need much to accompany it. Some crackers, maybe. Some crusty bread and butter. Or maybe just a blanket, some pillows, and the TV remote. This soup is particularly hearty. It stands up in the bowl, with a moat of rich broth surrounding the vegetables. It's almost a stew, but I refuse to call it that. If you want a thinner, brothier soup, you can cut back on the vegetables, or add more liquid. Adding more water will give you more broth, but it won't have much flavor. Instead, add a good-quality ready-made stock. But really, I suggest you leave it as-is. If you need to consume more liquids, sip on some hot tea. Or juice. Or maybe try one of Whole Foods' Italian Sparkling Water varieties. You'll get some bubbles, a little flavor, and without an overload of sugar. Nice and light and refreshing. One problem with cooking chicken is that the breast cooks faster than the dark meat. The white meat can dry out if it's overcooked, while the dark meat can withstand extra cooking time with no trouble. This recipe takes care of that issue. You'll see. And it's a one-pot recipe, except for cooking the noodles. For this soup, I made the noodles. If you prefer, you can buy noodles, or add rice instead. Remove the giblets and/or neck from the chicken. Place the chicken breast-side down in a large cast iron Dutch oven or similar pot. Rub a bit of olive oil (or butter, if you prefer) on top of the chicken. This will help to brown the skin which will give the soup a richer, roasted flavor. Add the chicken neck and gizzards, if you have them. Reserve the chicken liver for other use, or discard it. Put the Dutch oven in the oven and roast at 400 degrees until the chicken is browned. We're not looking to cook it through - just get some browning - about 30-45 minutes. Remove the pot from the oven and carefully flip the chicken over so the breast is now on top. (Or, if you prefer, remove the chicken from the pot and place it on a cutting board.) Remove the breasts from the chicken. Take the skin off the breasts, and refrigerate the breast meat until needed, later. If you took the chicken out of the pot, return it to the pot along with the skin from the breast meat. Add enough water to barely cover the chicken - about two quarts. Add one teaspoon of salt. Put the Dutch oven on the stove, heat to boiling, then reduce to a simmer. Skim off any scum as it collects on the top of the pot. Cover the pot and let it simmer gently for one hour. Meanwhile prepare the vegetables. Trim the ends of the celery. If your celery has outer tough stalks, you can add them to the stock to add more flavor and use the more tender inner stalks for the soup. Slice the celery into pieces about 1/4 inch thick. Peel the carrots and slice them to a similar thickness. Cut the onion in a medium-sized dice. After the chicken has simmered for an hour remove it and other solid bits from the pot. If there is a lot of fat at the top of the remaining liquid, remove some of it - you want a little bit of fat, but you don't want a thick layer. Add the celery, carrots and onions to the pot, and simmer until they are fully cooked - about 45 minutes. Let the chicken rest until it is cool enough to handle. Remove the meat from the thighs and legs, and any other remaining meat that's not overcooked. Remaining bits of breast meat might already be dry and chewy, but there will be other bits that are still soft and tender. Cut or shred the meat into bite-sized pieces and set aside until needed. Discard the chicken bones and skin. While the vegetables are cooking, you have plenty of time to make the noodles (recipe below). Remove the chicken breasts from the refrigerator and cut them into bite-sized pieces - not too small, since this is a hearty soup. Add this to the reserved dark meat. Chop the parsley roughly. Taste the soup and adjust the seasoning, adding salt, if needed. Add the chicken, parsley, and frozen peas to the soup and cook just long enough to heat the chicken and warm the peas. Add the freshly cooked noodles. Add a splash of lemon or lime juice to the soup to brighten up the flavor, if you prefer. Or, pass lemon or lime wedges at the table so people can add their own, as desired. Pile 2 cups of the flour on your work surface and make a well in the center. Add the eggs, sour cream, and salt to the well. Use a fork to break up the egg yolks and begin stirring the liquid in the center, drawing in flour from the outside as you mix, until you have a thick paste that you can work with your hands. Continue adding flour until you have a dough that you can knead. It should be fairly dense - not soft like a bread dough. Knead it until it is smooth and pliable, adding flour as needed to keep it from sticking to the work surface. Roll the dough to about the thickness of a corn tortilla. Flour the surface generously, then roll it up and cut it into pieces about 1/4 inch wide. Unroll the strips and toss them with some flour to keep them from sticking. Shake off the excess flour before you cook them. Cook as you would any noodle - in boiling salted water. Since these are fresh noodles, they cook quickly - check them for doneness when they float to the surface of the water. Add them to the soup just before serving. This is one of those recipes where you read it and think it's strange or wrong, but after you think about it, it makes sense. And here's the deal: once you've tried the basic recipe, you can change it up dozens of different ways - add some cheese, herbs, or even drizzle with lemon juice. Even if you go with the basic recipe, it's not your usual cauliflower. And maybe I'm weird, but I like the leftovers cold. Okay, I am weird. But I still like this stuff cold. Trim the green leaves off the cauliflower. Cook it until just barely done - you can steam it or microwave it, whatever you prefer. Don't overcook it. Spread a thin layer of mayonnaise over the cauliflower. Use just as much as you need to act as glue for the bread crumbs - you don't need a thick layer. The actual amount you'll need depends on how big the cauliflower head is. Coat the cauliflower with bread crumbs - as much as you can get to stick. Press it gently to help it adhere. Drizzle with olive oil or melted butter, if you prefer. You'll get nicer browning on the bread crumbs if you do so. When I was offered a sample bottle of Bärenjäger Honey Liqueur through Virtual Potluck, of course I said "yes." I like honey. It sounded interesting. And it sounded like something fun to work with. I'd never tried it before, but I figured that if I couldn't concoct a cocktail, I could find a way to cook with it. The honey flavor was obvious on the back end. On the first sip, there was the warmth of the alcohol, followed by the sweet, rich honey. I thought I might make a cocktail, but I couldn't gt the idea of a ham glaze out of my head. But the liqueur wasn't thick enough to work on its own. Ah, but mustard! Honey-mustard glaze sounded pretty darned good. This glaze is easy - you can measure or just eyeball it. In fact, you might need to adjust it after mixing so it's the correct thickness, since mustards will vary in thickness. The glaze should be thick enough so you can brush it on your ham, and it will stick in a thin layer. As the ham cooks, you can brush on more, if you like a thicker glaze. Combine all the ingredients, and brush on the ham before baking, and brush on again during cooking, if you like a thick glaze. After I made the ham, I still had the cocktail idea rattling around in my head. I wasn't sure where I was going with it. Maybe a warm drink? Then I started thinking about honey on pancakes. The idea of breakfast make me think of coffee. Then the coffee made me think about coffee cocktails. When my mind wandered around to the White Russian, made with Kahlua, cream, and vodka, the light bulb lit. I knew the honey liqueur would play a much better role than vodka, adding sweetness and flavor instead of just an alcoholic kick. But what about a name? Colorado Bee Sting sounded good to me. The coffee liqueur I used was one that I made at home, here in Colorado. Of course, you could use your favorite coffee liqueur rather than making your own. To get nice layers, put ice in your glass and pour the honey liqueur first, followed by the coffee liqueur, and topped with the cream. For a cocktail that's a little more interesting to observe, put ice in the glass, then add the coffee liqueur followed by the cream. Pour the honey liqueur on top and watch it move through the layers and settle on the bottom of the glass. For links to all of the Virtual Potluck recipes using Bärenjäger Honey Liqueur, go visit Foodhunter's Guide to Cuisine. Christmas is over. You've stuffed yourself with cookies. You're thinking that you'll start eating healthier in the new year. But ... but ... there are Christmas leftovers! Maybe a roast, maybe a ham. A sandwich would be nice. So, maybe you have a bread machine. That takes care of the lazy part. Then there's the healthy part. When it comes to bread, whole grains are usually what people are looking for. This bread is 2/3 whole grains, with 1/3 white wheat and 1/3 rye. The final third is bread flour, because I think it helps the texture of the bread. This makes a nice sandwich bread, and it couldn't possibly be easier. Remove the loaf from the machine when it is done baking. Let it cool completely on a rack before slicing. Sometimes you need just a little whipped cream. Do you remember hand-held egg beaters? When I was a kid, it was the only thing my mother had for beating - whatever. She didn't have an electric mixer until much later, and I don't recall her ever using a whisk. Maybe that's why she didn't bake a lot. An egg beater isn't just for eggs, of course. It's perfect of thin batters like cake or pancake batter, or for whipping things like cream or eggs. The funny thing is that I don't recall my mother ever using that egg beater for cooking. The only thing I remember her using it for was when I was allowed the indulgence of a bubblebath and there was a froth rather than a tub full of bubbles. Mom would use the eggbeater to whip up more bubbles. Good thing she didn't have an electric mixer, or I might not be here today. 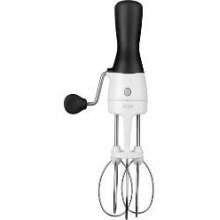 That egg beater was used for cooking, though - when I was a child-sized sous chef, it was my job to use it for mixing whatever needed mixing. As a kid, I thought it was a fun tool to use. As a adult, I thought it might be useful once in a while. So, a few years ago, I bought one of those old-fashioned egg beaters, just like the one my mother had when I was a kid. I thought I might use it when an electric mixer was overkill, but a whisk would be too much work for my aching wrists. You know, like for making whipped cream by hand. Okay, I'll admit that I have a nitrous cream whipper, but sometimes I want a small batch, and other times I might want a few different flavors. Yes, flavors. I like adding flavors besides vanilla. Here's one that I particularly liked. Hazelnut or almond liqueur is also great in whipped cream. Raspberry syrup is also really interesting. The old-fashioned eggbeater I bought years ago had a nostalgic charm, but it was unpleasant to use. I tried it a couple times, but it simply didn't do the job as well as I remembered.. Maybe I was a little more forgiving when I was a kid. So when OXO offered me an egg beater to test, I figured I'd give it a try. It couldn't be worse, right? To begin with the OXO beater was completely redesigned. Okay, there were two beaters on the bottom and there's a handle to turn, but that's where the design similarity ends. I gave it a little test drive, and the vertical handle made a heck of a lot more sense. It was actually pleasant to hold onto. Instead of being a one-piece unit, the base comes off, and the beaters come off the base for easy cleaning if you got really messy. The whole base is dishwasher safe, too. But the big improvement is actually a little thing - a wire. That wire elevates the beater blades just a little bit above the bottom of whatever bowl you're working in. Instead of the blades bumping against the bottom - or you trying to hold the beater above the bottom of the bowl - the blades stay elevated on their own. Genius. I'm not getting rid of my stand mixer, and I'm not getting rid of my electric hand mixer, either. But for those times when I might otherwise decide to hand-whisk something, this little beater is going to be handy. And my wrists won't be complaining afterwards. Would you like your very own beater? You would, wouldn't you? I just happen to have an extra one, and it might have your name on it. For the mandatory entry, leave a comment here. Tell me what your favorite old-fashioned cooking tool is. Or tell me about a weird kitchen tool your mom had. For another entry, follow @dbcurrie on Twitter. Come back here and tell me that you followed me. That's it! Maximum three entries per person. Contest is now CLOSED and the winner is Wanda! OXO supplied both the eggbeater I tested as well as the one I'm giving away. I was not obligated to give a positive review. I reviewed a Mr. Beer beer making kit about a month ago. That's about how long it takes to brew beer using the kit. Two weeks in the plastic keg to ferment, then two weeks in the bottles to become carbonated. Then it just needs to be chilled. It can age even longer in the fridge, but we decided to pop one open right away. I mean, why not? It's a holiday. Yes, it's definitely beer. Pretty good beer, actually. Well, how about that? It was a reddish golden color, a teeny bit sweet, and not overly hoppy. Which is great for me because I'm not a big fan of heavily-hopped beer. And of course, this was just one possible beer from a pretty big selection of different beers. Will this beer appeal to everyone? Probably not. But let's face it, if you name any commercial beer, there will be some people who like it and others who hate it. All I've got to say is the kit was easy to use, and it was kind of fun to brew my own beer. I've already ordered two different cider kits and two more beer kits. That ought to keep me busy for a while. Meanwhile, my first batch of home-brewed beer is on the drink menu for Christmas. I'll be toasting with it a little later today. Dinner will be classic - a rack of pork, mashed potatoes, gravy, and green beans. What's on your table? I hope our holidays are great, whatever you celebrate. And a little teeny gift to you. If you order from Mr. Beer through the end of December, you can get free shipping if you use the coupon code "cookistry" when you order. Stir-fries are the ultimate fast-cooking meal. You can have dinner on the table in almost no time, particularly of you do the prep work in advance. Or, if you're at the store and want to start cooking as soon as you get home, you can buy some of the ingredients prepped for you. For the beef stir fry, I picked up a package of prepared stir-fry vegetables, and added some extra onion, just because I like it. Beef for stir fry can come from any number of cuts, so ask the butcher what's good at a good price. Flank steak works well, as do many other steak cuts. You can certainly buy a steak and slice it yourself for your stir fry, but you can also buy it pre-sliced and ready to cook. You can use leaner cuts of meat for stir-fry as long as you keep in mind that they should be cooked quickly and cooked no more than medium rare. Stir fry isn't all about meat, though, so I've got another option for you - shrimp. You don't need to buy super-huge shrimp for your stir fry - medium shrimp are just fine. If you buy shell-on shrimp, you'll need to remove the shells and de-vein them. Or, buy them already cleaned. Either way, they cook very quickly. My preferred side dish to go with a stir fry is rice. That's the longest-cooking item for this meal, but if you've got a rice cooker you can set it up well in advance to have the rice ready when you get home, One of my favorite things to do is to add just a pinch of saffrom when I cook the rice. It adds rich flavor and glorious color. Heat the oil in a wok or heavy-bottomed frying pan. Add the vegetables and the onion, and stir fry until they begin to soften. Add the beef and the red pepper flakes, and cook until the beef is browned on all sides. Combine the soy sauce and cornstarch, and stir to combine. Add this to the wok, and stir quickly to coat the meat and vegetables. 1 pound medium shrimp, shelled and de-veined. Heat the oil in a wok or heavy-heavy bottomed frying pan. Add the peppers, onions, salt, and pepper flakes. Stir-fry until the vegetables begin to soften. Add the shrimp and cook until they become opaque. Add the tomato paste and stir until combined. Serve immediately. For information on Whole Foods Friday, see the tab at the top. This post is sponsored by Fooducopia. For more details, see the tab at the top. I don't do a whole lot of gluten-free baking, so when Fooducopia gave me gluten-free all purpose flour mix made by Outrageous Baking to work with, it was a challenge. I decided to use it in a recipe where gluten-development was pretty much undesirable - shortbread dough. But even though gluten-free flour mixes are designed to mimic the properties and flavor of wheat flour, it's never an exact match. This dough felt different as I handled it. But in the end, it worked. And no one I gave them to thought they were unusual in any way. And that's all that counts. Cut the butter into several pieces, Put all the ingredients into your food processor and process until the mixture forms a coherent dough. Remove the dough from the processor, wrap it in plastic wrap, and place it in the refrigerator until it firms up - about an hour; longer is fine. Divide the dough into 24 equal pieces Place a piece into a mini-muffin tins and press the dough into the bottom and part way up the sides of the tins. If you have a tart tamper, you can use that to press the dough, or a shot glass with a flat bottom will do a fine job. Bake at 325 degrees until the shortcake cups are lightly browned - about 12 minutes. Let the cups cool in the pans until the firm up - about 10 minutes. Remove the shortcake cups from the tins and let them cool completely on a rack. To serve, fill the cups with a bit of jam or jelly or preserves, sweetened cream cheese, caramel, or whatever you like. I've recently made coffee liqueur, walnut liqueur, cranberry liqueur, and a few others. And I've been brainstorming about what else I might make. I've looked in the spice cabinet and in the refrigerator, and it's something I think about when I'm at the grocery store. When I was shopping for some cookie supplies, I grabbed some hazelnuts, and the liqueur lightbulb lit. I've bought hazelnut liqueur. Why not make my own? It's nice on its own, or next to a cup of coffee (or in the coffee). Toast the hazelnuts lightly in a skillet or on a baking sheet in the oven at 325 degrees, watching them carefully and stirring them as needed. You want them just lightly browned - if they burn, they'll become bitter. Chop the hazelnuts into small pieces - about the size of grains of rice. You can do this by hand, or in a food processor, but if you use a food processor, make sure you don't turn them into a nut butter. Put the chopped hazelnuts into a quart jar with a tight-fitting lid. A canning jar is perfect. Split the vanilla beans lengthwise and add them to the jar. Add the vodka, sugar, and water, Seal the jar and shake to dissolve the sugar. Leave the jar in a cool place out of direct sunlight. Shake it once or twice a day for at least two week - if you have time, you can let it sit for a month. When you're ready to bottle your drink first strain it though a fine-mesh strainer. Next play a paper towel in the strainer, and strain again to remove fine bits. If you want a clear liquid, strain again, this time through a coffee filter. Don't be tempted to go directly to the coffee filter after straining out the larger bits - the fine bits will gum up the coffee filter and it will take a loooong time to strain. Use your home-made liqueur in any cocktail where you'd use a commercial hazelnut liqueur. I like books. I love cookbooks. And I love books about food and cooking. And food production. And the history of food. And food in general. There are some food books that I own that I love but wll never cook from. I love them for their humor, their science, or their information. Sure, some of them have recipes, but their real value to me is something other than the recipes. If you read cookbooks like novels, you know what I mean. And if you think that's a bit odd, but you like food-related books that aren't cookbooks, you still know what I mean. I've got a list of some books that you might be interested in, and if you make it all the way to the bottom, you'll see that I've got something for you, too! One interesting book on my shelf is Salted by Mark Bitterman. There are some recipes that feature salt, but the real value to this one is the rest of the book. I find it hard to believe there's a question about salt that Mark Bitterman couldn't answer. In this book, he talks about the history of salt, the science of salt, the types of salt, and the methods of harvesting and processing salt. There's a section with color photos of different kinds of salt, and closeups of salt crystals are kind of pretty. From a distance, salt is salt. Well, you can see the differences when you're looking at a colored salts, but when you look at them close-up, there are some huge differences between the white varieties, too. 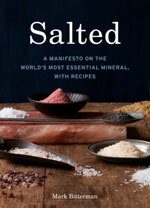 I may never get my hands on most of the varieties of salt in this book, but it's still fascinating. And quirky. Bitterman describes the color of one salt as "dawn reflected off wet pavement," and he describes the flavor of another as "volcano; egg; dragon breath." Another salt is the color of "cappuccino sea foam" and its flavor as "chicken-fried ocean." I think I'd like that flavor better than dragon breath, but both sound interesting. And yes, there are recipes. I will be getting to them soon, but meanwhile I've got a lot of reading to do. Quite often, people ask me what one bread-baking book I would recommend. There are a lot of books that I love that have recipes that I use quite often. There are others that I use for references. 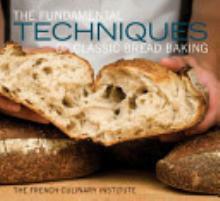 But if I was suggesting one bread-baking book for someone to learn from, this book would be high on the list. Because it's more than just a cookbook, it's a textbook. Most cookbooks and most recipes assume that you know some things. Textbooks assume that either you're a blank slate, or you're doing things wrong and need to be re-educated. When it comes to bread baking, there are a lot of ways to do things. A lot of methods that will result in a good loaf of bread. But there's a difference between a good loaf of bread and a classic loaf of bread. It's like the difference between a pot of random vegetable soup and vichychoisse. That clean-the-refrigerator soup might be great, but it's not a classic recipe. Working with bread dough has a lot to do with the look and feel of the dough, and that's hard to describe in words. This book has the photos you need. Slashing technique is there, and photos of the finished bread as well. It's all there. And recipes. Plenty of recipes. I have a few bookmarked for later. I'm sure you'll be reading about those later. One great thing about this book compared to some other textbook-like books I have is that the recipes are for reasonable amounts of bread - you won't have to make a half-dozen loaves, and you won't have to scale recipes down so you won't have to feed the neighborhood. Yep, another textbook, but this one is more about cooking than baking. I have an old version of this book that I picked up at a garage sale for cheap, but things have changed a lot in the food world. I mean, okay, methods are still the same and classic recipes are still the same, but do you want to know about today's recipes, or the ones that were popular 20 years ago? When I found the older book at a garage sale, I sat down with it and read it for days on end. I probably will never work in a restaurant kitchen, but it's still interesting to know how one works. But there's more than just running a restaurant. There's knife sharpening instructions, information about kitchen tools, photos if food, and diagrams meat primals and photos of different cuts of meat. And yes there are recipes. Plenty of them. This book weighs in at over 1200 pages. Beginning with bouguet garni and progressing to stocks and sauces, it covers just about anything you'd want to cook. Want to make fresh pasta? Yes, you can. Roast some meat? Of course. Pan fry, boil, steam, poach ... even information on how to use a piping bag. It has to be comprehensive - it's a textbook. But it's not all standard American fare. There are recipes for ethnic foods of all sorts, from Polish to Irish to Asian. These might not be the same recipes you'd find in books based on those regions, but they're good, solid recipes, with techniques that are well-explained. And you've got to figure that recipes in a textbook will work, no questions asked. I haven't finished reading this book, and I haven't cooked any recipes from it yet, but I've already used it as a resource when I've wondered about techniques, formulas, and cooking times. I plan on spending a lot more quality time with this one. I'd recommend this one to anyone who wants to learn the basic foundations of cooking, and who wants to have a comprehensive cookbook. I've been cooking for a long time, and I'm darned happy to have this one in my collection. You might have noticed the the books I'm writing about here are not cookbooks in the traditional sense. This one is in fact a cookbook. But it's certainly not a traditional cookbook. I guess that's what's to be expected from Ferran Adria. 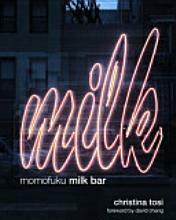 But this isn't about molecular gastronomy. This is about family meal. No, not your family meal. In this case, family meal refers to the meals that are served to restaurant staff. 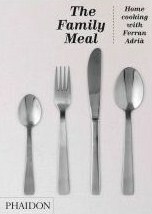 But the general idea here is that the family meals served at Adria's restaurant el Bulli are very accessible to home cooks. While the recipes are home-cook worthy, this is one of the most unusual cookbooks I've seen - because of the way the recipes are formatted. First, recipes are presented as complete meals with a first course, main dish, and dessert. Second, recipes are very visually presented. There are photos of ingredients, a list of ingredients required, and a timeline for completion of the recipes. It's genius. Instead of looking at a recipe and trying to judge how early you need to start cooking in order to have it all done for dinner, this one tells you when to start each step. So you might have to throw a roast in the oven 4 hours before you plan on serving, and then 2 hours before serving you might start some process for the dessert. When it comes to the actual recipes, there are photos with each step with the text overlaying the photos. 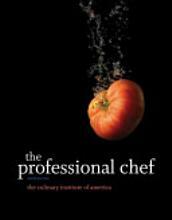 If you're a visual cook, this is THE book for you. While the timeline for the meal includes the steps for the combined meal, each recipe is presented separately. So if you want to serve the Mexican-style chicken with the pina colada or the banana with lime or the chocolate mousse instead of what the menu suggests, you can mix and match as you please. I'll be back with a recipe from this one later. This is a traditional cookbook, but the featured ingredient isn't so traditional - truffles. And I'm not talking about the chocolate kind. This is sort of a "wish" book. Unless I win a contest or someone gives me a very generous gift, truffles are pretty much out of my budget. But that doesn't mean I won't be cooking from this book - with variations. I can get my paws on truffle oil and truffle salt ... and maybe some other fancy mushrooms. 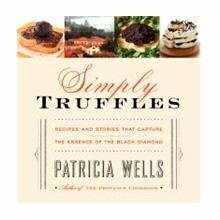 I can certainly modify these recipes to work with what I've got, and dream about fresh truffles in the meantime. On the other hand, if you ever have access to fresh truffles, recipes aren't exactly rampant in cookbooks. People might tell you to shave them over eggs or pasta. But is that good enough? Why not use recipes designed for those truffles? Will I ever cook from this book? Maybe. I hope so. Meanwhile, I'll be reading about truffles, just in case one shows up on my doorstep. When it comes to dessert cookbooks, this one is definitely innovative. Some crazy, crazy recipes here. These are the ones that make you scratch your head and wonder how they came up with this stuff. A lot of the recipes build on other recipes. So, you make cereal milk and use it for ice cream, or you make one of the "crunch" recipes and use it in cookies. None of the recipes are overly complicated, as long as you take it one step at a time. The book includes the recipe for compost cookies and crack pie - I've heard of both of them, even though I'm across the country from the restaurant. I've bookmarked the Brownie Pie for a later indulgence. It looks pretty darned amazing, even without additional garnishes. Do you love desserts? Do you want to wow people with innovative desserts? Yeah, this is the book for you. You'll be reading more about this one here, I'm sure. The first book that isn't any sort of a cookbook, this does include recipes - just a few. This book is a historical look at sweets in different parts of the world. The love of sweets makes sense. Sugar is energy. Humans like sweets because we need energy. It's a simple need, but how humans have found a huge number of ways to fulfill that need. I haven't finished this book yet (so much reading to do!) but so far, it's interesting. When I think of dessert, I think about apple pie and chocolate cake, but cultures have been indulging in sweet treats for a long time. Perhaps at first reserved for the privileged classes or special holidays, now we can have dessert any time we want it. But why not learn a little bit of dessert's history, and celebrate it a little bit. I'll have a scoop of ice cream with mine, thank you. If you're a blogger, you know that taking good photos of your photos is a big deal. I've spent a lot of time and wasted a lot of electrons taking bad photos. 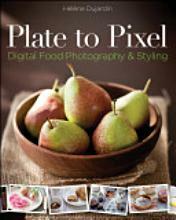 Plate to Pixel is all about taking better food photos. From white balance to aperture to ISO to composition, this covers it all. What it tells me is that my next step might be a better camera. I still need to work on things like composition and setting up a better area for photos when natural light isn't optimal. But I'm getting there. Even if you aren't a food blogger, good photos are good photos. With this book, you might surprise yourself by taking better photos. I've got some books to give away. Yes, more than one. Somehow, I've managed to get duplicates of some books, and it's time to find new homes for them. I'm not going to tell you what they are. Some are cookbooks, and some are food-related books. NONE of them have been mentioned here. It will be a complete surprise. For your first mandatory entry, tell me what your favorite food-related book is, that you discovered this year. It can be an old book or a new one, as long as you discovered it this year. For an optional your entry, tweet a link to this contest. Come back here and tell me that you tweeted. For another entry, tweet this: "Check out these crazy brownies from @dbcurrie and @cookstry at http://su.pr/1n7S5" Come back here and tell me that you tweeted. For one more entry, go comment on those brownies you just tweeted about. Come back here and let me know that you commented. About the multiple books: I have up to SIX books to give away. For every 25 entries, I will add a book to the giveaway, up to 6 books. So up to 25 entries, there will be one book given away For 26-50 entries, there will be 2 books. For, 51-75 entries, there will be three books ... you get the idea. Winners will be chosen randomly from among all the entries. Contest is open to US residents. Contest opens when this posts, and ends at noon on Monday Dec 26. For more contest details, see the Contest tab at the top. Contest is over - Congrats to Cat, Cathy and Alexis! Oh, and if you've got a spare mouse-click, go vote for me in this contest. No extra entries, no special treatment. Karma is good, though, right? Thanks! Recently, I got a review sample of King Arthur Flour's Traditional Gingerbread mix. The interesting thing about this mix is that it has instructions for making either cookies or cake. I flipped a coin. Cookies won. Cookies always win, it seems. Probably because cake is soft and fragile. It's no match for crunchy cookies. The ingredient list in this mix is reasonable. Nothing scary. King Arthur flour, sugar, molasses, spices, cornstarch, baking powder, salt, natural flavor, baking soda, and caramel color. The spices and flavors weren't listed, but when I opened the bag, the ginger smell was obvious. The required ingredients for cookies were butter, egg, and water. That's easy enough. Equipment needed is minimal, too. Just a bowl and a spoon to assemble the dough. The soft butter is mixed into the dough until it's all crumbs, then the egg and water go in. Mix, knead, then chill it in the fridge for a while before the roll-cut-bake. The result? Pretty good cookies, actually. Here's the thing. I've been baking so many cookies lately that I don't want to even taste them. But I just ate two of these, because they're spicy. Yes, they're a little sweet, but they've got a savory punch to them. I'm probably not the prime candidate for buying boxed mixes because I don't mind the measuring and mixing, and I have all of the ingredients on hand so I don't have to go shopping before I bake. On the other hand, I'd have no problem using this mix if I needed to shave a little time from my schedule. I'd sure as heck use this mix before I'd buy pre-made cookies, that's for sure. Oh, and if you like the little stars, those are edible glitter, also from King Arthur Flour. I've been sprinkling them everywhere. I entered another Marx Foods contest, and this one is all about chocolate. As usual, Marx supplied (for free) some interesting ingredients, and the goal was to use at least one of the ingredients in a recipe with chocolate. The vanilla beans were too easy, so I set those aside. The coconut sugar was promising, so I put that in the "yes" pile. There were candycap mushrooms the box, but I just finished a candycap mushroom contest, so I decided not to use those. Then there were peppers. Chocolate and spice go together well, but that almost seemed too easy. Too expected. A trendy pairing. So that left fennel pollen. Yep. Fennel Pollen. Pollen from a fennel plant. It's interesting stuff. Tastes like fennel which tastes like anise which tastes like licorice. I figured it would work well with chocolate. For the contest, I made brownies. And for a little extra flavor, I used browned butter. Butter is good, browned butter is ... yum. Preheat the oven to 350 degrees. Fold a piece of parchment paper so it is 8 inches wide. Place it in the botton of an 8x8 square baking pan with the long ends coming up the sides of the pan. For extra insurance, you can spray the uncovered sides of the pan with baking spray. In a small pan, melt the butter, and continue heating it until it begins to brown and it smells nutty - don't let it burn. Brown is good - burned is bad. Set aside. Combine the flour, cocoa powder, baking powder, and 1/2 teaspoon of kosher salt. Whisk to combine. Add the dry ingredients to the egg and sugar mixture, and beat on low until blended. Add the melted butter and beat until it is all combined. Pour the batter into the prepared pan. Combine the remaining 1/4 teaspoon of salt and the fennel pollen and sprinkle it evenly over the top of the brownie batter. Bake at 350 degrees until a toothpick inserted in the center comes out clean - about 25 minutes. Let the brownies cool in the pan on a rack, then use the ends of the parchment paper to lift them out of the pan. Slice and serve. These brownies were created for a contest at Marx Foods. Please vote for me here. If you want to know more about Whole Foods Friday, check out the tab at the top. Blue cheese salad dressing can be very simple. If you start with good blue cheese, you just need the creamy base for it. Well, even if you use non-great blue cheese, all you need is the creamy base. But you don't need to add herbs, spices, or other flavors. Let the blue cheese do all the work. To make it even better, crumble some blue cheese on top of the salad as well. I'd suggest using your favorite blue cheese - or at least one that you like to eat. It's what you're going to taste. This is also a great way to use up bits and pieces of blue cheese that you have hanging around in the refrigerator. This is more of a formula than a recipe with measurements, but this lets you make exactly as much as you need. Stir the mayonnaise to loosen it up a bit. Combine equal parts of mayonnaise and buttermilk. Stir or whisk to combine and smooth it out. Use a fork to make crumbles from the cheese. Add an equal amount of cheese as you have mayonnaise. Stir to combine, breaking up any large chunks, but leaving the smaller bits - you want it to have texture. Serve on top of your favorite salad greens. Refrigerate any leftover dressing.